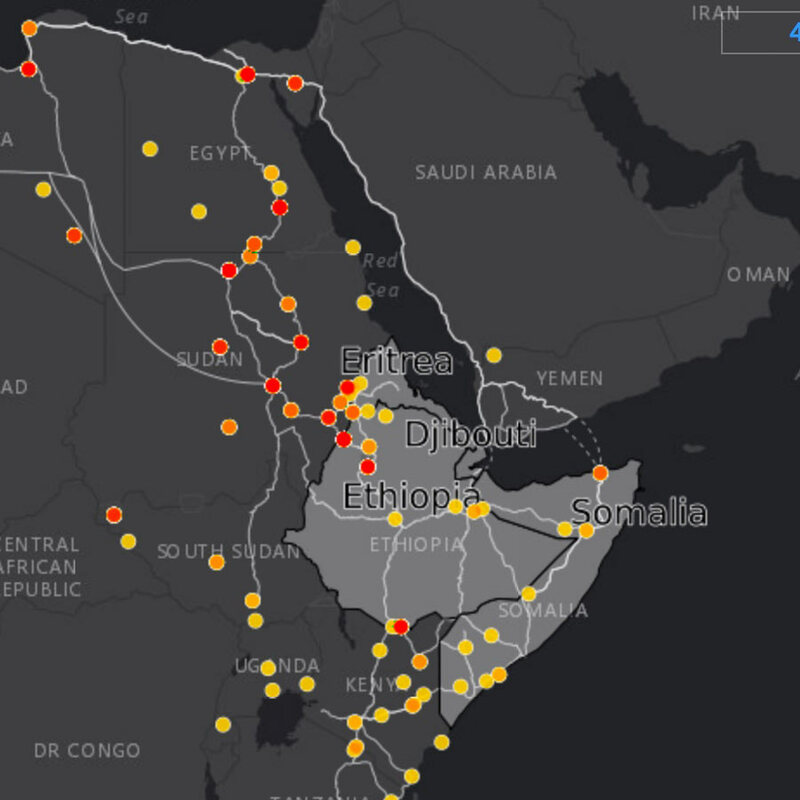 Since 2014, 4Mi has been developing a unique network of field monitors situated along frequently used routes and in major migratory hubs. 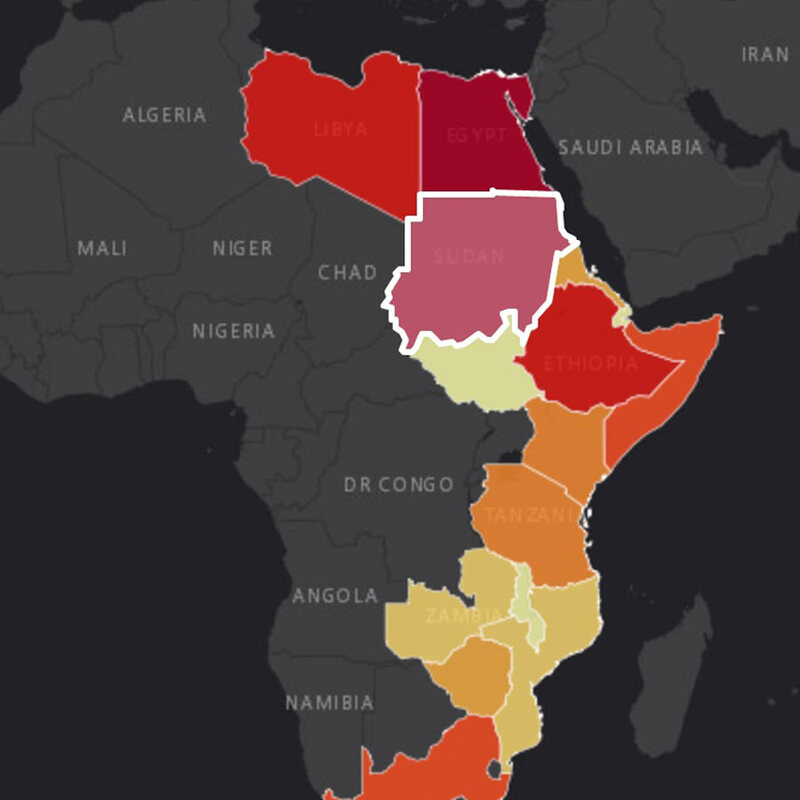 It aims to offer a regular, standardized, quantitative and potentially globalized, system of collecting primary data on mixed migration flows. 4Mi’s male and female monitors conduct in-depth interviews on a continuous basis with men, women and youths. Where possible they also interview smugglers and others involved in the facilitation of mixed migration. Monitors are trained and closely supervised and use a smart phone-based survey application to record and transmit completed interviews to regional 4Mi hubs for storage and analysis. As of early 2018, 4Mi collects approximately 1000-1200 interviews every month. 4Mi predominantly uses a closed question interview survey to invite respondents to anonymously self-report on a wide range of issues that results in extensive data relating to individual profiles, migratory drivers, means of movement, conditions of movement, the smuggler economy, aspirations and destination choices. 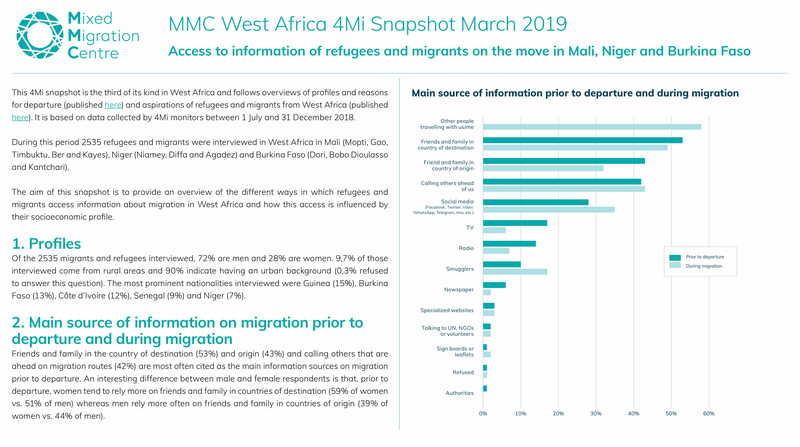 Information collected directly from refugees and migrants on the move or who have recently arrived at a point of destination or returned home is critical to the work of the Mixed Migration Centre (MMC). It is critical to our understanding of the drivers of migration, the choices people are making in terms of their journeys and destinations, their intentions and aspirations, and especially necessary to understanding the conditions under which they travel and their protection needs. Currently, 4Mi manage approximately 100 monitors in 20 countries including some in northern and southern Europe. The primary focus of our interviews are those using the West African route towards Libya and onwards to Europe, the routes out of the Horn of Africa to Yemen, Southern Africa and Europe, the North African route from Libya and Tunisia to Europe and in Asia the flow of Afghans out of Afghanistan towards Europe as well as into India and Indonesia. In 2018 and beyond, 4Mi intends to expand to cover other regions of the world and additional routes used by refugees and migrants. 4Mi fills information gaps around protection and vulnerabilities with a view to informing policy and humanitarian programmatic response as well as enhancing sector understanding and knowledge on migration dynamics. It is managed by the Mixed Migration Centre, Geneva under the overall auspices of the Danish Refugee Council. The data gathered from the 4Mi network is increasingly becoming the foundation of our analysis and policy influencing work and is used in reports and databases of other agencies It influences MMC global and regional analysis through its As we constantly seek to improve the methodology and widen the scope of 4Mi’s reach, we place those on the move and what they say at the heart of our understanding of the mixed migration phenomenon. 4Mi Trend Reports are issued monthly and present data collected by regional 4Mi teams.